Okay, time for a rant. Ready? Here goes. As most of you know, I’m “big” into Simplicity. That’s why I chose to write a book about it. But why is it whenever somebody discusses simplicity, it’s always from a far left green or New Age perspective? Can anyone explain to me how these perspectives are supposed to simplify one’s life? 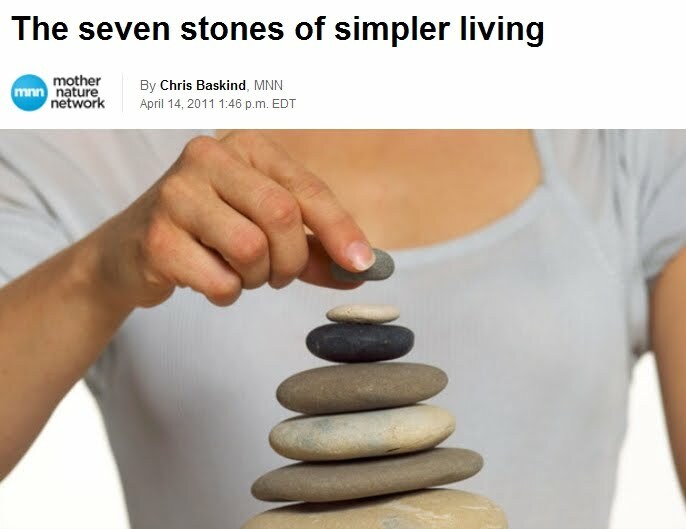 This latest piece of sunshine came from CNN Living and is entitled The Seven Stones of Simpler Living. As you can imagine, was I delighted when I saw the headline this morning. I’m always interested in simplicity perspectives! But, unsurprisingly, this article was a disappointment because it is not a guide to simple living; it is a guide to green living. It admits as much under the first suggestion (“Anyone who thinks they can shop their way to greener living has been watching too much television.”) Look, if you want to go green, by all means do so. We have. But don’t call it simplicity. Ironically, all of these suggestions appear in my own Simplicity book in one form or another because I have an entire chapter on Green Living. However I must point out if you’ve complicated your life through multiple divorces with resulting out-of-control kids, or if you’re up to your eyeballs in debt; or you’ve otherwise made choices that had added a huge level of complexity to your life... then driving your car less or growing your own tomatoes won’t do squat to simplify your life. It might lower your Chevron bill or spice up your salads, yes; but it’s not the answer to a simple life. The point of this rant is to distinguish between simple living and green living. They are not the same thing. The only tip on this list which is directly proportional to simplicity is reducing your personal stress. On this point, the author is correct. But then again he mixes up going green with reducing stress. Recycling our plastics does not appreciatively reduce my stress level. Living with well-disciplined children (because we chose to be their parents instead of their friends) does. See the distinction? The essence of a simple life is to make good choices, and the biggest choices you can make involve your spouse and children, followed by living within your means and staying out of debt. In other words, BIG ticket items. If you’ve chosen to get married before having kids; if you’ve chosen a good spouse; if you’ve chosen to treat your spouse well; if you’ve chosen to discipline your children (and perhaps chosen to homeschool them so they aren’t adversely impacted by peer pressure in schools); if you’ve chosen to stay out of debt and live within your means…then you’re well on the road to simplicity. I think whoever wrote the Seven Stones probably meant well. A few of the stones are good advice, such as learn to give back and preparing to grow your own food. But, instead of "preparing" to grow food, why not just go ahead and grow your own food? As for the rest of the stones, they're just more of the same impractical and often inane advice progressives keep giving us every day. They helped create this world of great consumption -- including the credit card scam -- where we all must participate to survive. They enticed us to partake of all the wonderful things that have been invented and they have forced us to become great consumers, then they tell us not to consume so much! No wonder we're stressed. As for reducing our reliance on automobiles, believe me, we've done that. We had to! We live 25 miles from the nearest town. My wife works in a grocery store in that town, so she picks up our groceries and such when she gets off work, killing two birds with one stone, as they say. We make very few trips to town, only when absolutely necessary. But while we're told to reduce our driving, we've been forced into a lifestyle that requires us to drive more! Horse buggies. bicycles and walking are not the solution. At least, not if we want to get any sleep between long trips to where we work and shop! Although it's increasingly more difficult to do so, we are reducing our waste stream. A little. Maybe if groceries, light bulbs and all other products we buy weren't wrapped up in so much paper, plastic and such, we wouldn't have so much to have to throw away. Ya think? We've trimmed our energy usage, too. All of our neighbors have. So the power companies just charge more for their electricity! (After all, they have to keep their profits up.) You can't win that one. As for learning to give back: We were once involved with most of the sports teams at our local high school back before we moved to where we live now. Football, baseball, tennis and soccer. We helped a lot of the kids whose parents couldn't buy them cleats or pay for their lunches at away games. We gave kids rides. We supported them and helped them every day. We have lived here ten years, now, and in that time only two of the dozens of kids we supported and helped have come to visit us. And we're not that far from them. Only about 220 miles. We get very few or no e-mails from them. No birthday greetings, happy anniversaries or merry Christmases. Nothing in return. And again, WHO is responsible for creating this gimme gimme world where our kids know only how to take, and not give? The same ones who tell us to learn to give back! The socialists who tell us to live a "green" life and to "simplify" our lives are the same ones who push Obamacare (2,100 pages long) and other extremely complicated laws that do nothing but add complications and stress to our lives. Hypocrites! Data proves that the very same socialists who tell us to "give back" are far less generous in their giving than are Conservatives. Once again showing that the socialists are hypocrites! Conservatives teach their chilcren to turn off the lights when they leave the room. Conservatives teach their children not to litter and not to pollute. These are not "green" ideas or socialist-do-gooder ideas, these ideas have been part of Conservative teachings since day one. We Conservatives don't waste - "waste not, want not" was one of my mother's favorite sayings when I was a child. It really ticks me off to see these progressive socialist commie pinko slugs telling everybody how to simplify our lives or how to live a green life when they are actually the biggest offenders of their own rules. Ask Al Gore how many square feet his house takes up on the planet. What about his carbon footprint? How about George Soros and his homes all around the world? Do these guys get a pass because they are so much more important than us little people? I guess in their minds they can do anything because they are demigods and we are mere mortals. I say screw them. Ooops, was that too harsh? My apologies to Patrice and her readers, but I will not apologize to the socialists who preach one thing and do another. HYPOCRITES!!!! AP--right again! Do as I say, not as I do--isn't that the Obama's motto as well? I don't think people are buying their crapola anymore. Coincidentally I read this story a few minutes before heading over here. Or started to read, I should say. I got as far as the middle of the first sentence under item number one and ran into the word "greener." Click, good-bye. for me, a simple life to live is alot like cleaning out the closets...and living with the stuff you have deemed important enough to keep. and getting rid of the clutter. simplicity not only applies to my closet, but every other aspect of my life as well. these days i do live a greener life..sorta like that of my grandparents and parents..but that is my choice. if we lived a greenlife according to the environmental whackos of the world, i would again be in debt up to my eyeballs, bored out of my mind and my life would no longer be the simple one it is. I find the term "well-disciplined" applied to children rather ominous. Horses, maybe. I expect as usual I am the odd one out with this comment. Isn't it interesting, that a truly simple life, requires more work than many leftists are willing to do. The simple explanation of how the extreme green and new age movements can promote their agendas as "simple living", is that they have hijacked the words and true definition. To Quedula--Yes, you're the odd one out, but I understand why you said what you did. The term "discipline" has gotten a bad rap in these "progressive" times, and that's a shame. Ther word "discipline" is related to the word "disciple." The Bible tells us that Jesus taught his disciples to follow a certain code of conduct (read Jesus' Sermon on the Mount--particularly the Beatitudes) based on two simple principles--love God with all your heart, soul, mind and strength, and love your neighbor as yourself. As parents we are responsible for "discipling" or "disciplining" our children in the same way. Correct/punish them when they do wrong, praise them when they do right, and lead them on the path of righteousness to seek God's face and to follow His commands through His Son Jesus Christ. The end result of this disciplining is that the child will grow to be a wise human being who loves God, submits joyfully to the Lordship of His Son Jesus Christ, loves and serves others just as he would himself, and who is capable of self-governance and of responsibly enjoying individual liberty within a constitutional republic. You can't discipline a horse, or any other animal for that matter. You can train a horse, but they are incapable of discipline. Simple animals don't have that divine spark within them that comes from being created in the image and likeness of the Creator--Almighty God. To AP's point, it's been my experience that the hypocritical progressives (I call them "liberaliars") have a far different definition for "simplify your life" than we truth-loving conservatives do. Liberaliars want to simplify OUR lives by forcing us to live under THEIR command. They're so much wiser and more compassionate than we are, don't you know? We conservatives are way too simple to govern ourselves after years of bitterly clinging to our guns and our religion, so more "enlightened" liberaliars have to become our benevolent caretakers. For our own good! God bless you AP for pointing out their dishonesty. When you look a little deeper into the dishonesty of the left you find out that the "New Green" is just the "Old Red" in disguise. I second your emotion in every way! And great response, Bruce, on discipline. That's a keeper. Quedula, most of us seek to be "self-disciplined" in our various areas of life. In other words, we adults would much rather be around disciplined adults rather than undisciplined, self-centered boors. Most people get tired of being around the alcoholic or the constant chatterer or the gossip. In other words, we like to be around people who practice discipline in their lives. You rarely get disciplined adults from undisciplined children. quedula, in my experience, "well-disciplined" only sounds ominous to people who expect every conservative parent who "disciplines" their children to be "whipping them all soundly and putting them to bed", so to speak. That is a very stereotypical and astoundingly uninformed point of view. The rest of your comment is just sermonising. The Britis atheist is not "the odd one out" she is merely "the odd one"...period. Her goal is to engage in "debate" while never acknowledging points well made by Christian Conservatives. Don't feed into her ego - ignore her. By ignoring her, you defeat her. Discipline: 1. training to act in accordance with rules. Dear quedula, I recommended many months ago that you should just be ignored. Not to be mean or spiteful, but because it will do no good to try to reason with someone like you. I'm wise to your game. You seek neither understanding nor truth. Your goal is to annoy. To stir things up among the "rabble" who you feel are beneath you. You believe you have a superior intellect, which is typical liberal progressive behavior. Mr. Gordon is absolutely correct and YOU are totally wrong, but your huge pride prevents you from ever admitting it. A liberal blog would never endure any conservative who tried to disrupt and annoy the way you do. You take advantage of good people like Patrice Lewis. What you do is hateful, plain and simple. You are a hateful person trying to make others hateful. There IS hope for you, however. Yes, I'm going to ignore you and I hope others will, too. But I will also pray for you, as I'm certain many others will also do. As long as you continue to live, there is still hope for you. God bless you. Another thing AP it isn't your prerogative to advise people to ignore me. This isn't your blog.